Accessed by clicking the Play game shortcut icon.The dialog is also accessed from the Play->New game... menu item. This dialog enables you to configure the type of game you wish to play against the computer. This section allows you to enter the name of the player who will play the game (it defaults to your name). You can access Rated users statistics by clicking on the ... button next to your name, this will display the Rated user dialog. You can choose if you want the game to be a rated game. The player's current rating is also displayed, here it is 1600 Elo. This section allows you to select your opponent. 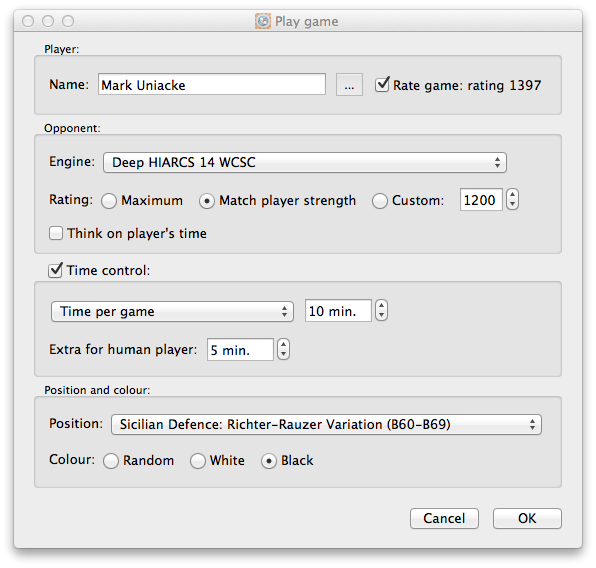 Any engine loaded into HIARCS Chess Explorer can selected, however not all engines support set Elo ratings like HIARCS chess engines. Also no other chess engine supports the play realism of the HIARCS chess engines. Custom allows you to set a specific Elo rating for the engine to play at. The up and down arrow selector will increase or decrease the value in 25 Elo steps. You can of course click on the value and set an exact value from the keyboard. If you want your opponent to also think about its next move while it is your turn to move you can turn this on or off using the Think on player's time checkbox. No time control selected - the opponent will move instantly, nice for casual play. In addition to these time control settings you can also set extra time on the players clock at the start of the game. This option allows you to set the starting position for the game, for example you can set the standard starting position or a position from a well known opening which is very useful for practice and learning. You can select either the current position from the database tab when you started Play->New game... or you can select from a huge range of chess openings that you may wish to practice against. Please see the Learning to play openings section for details. This allows you to set the colour you wish to play, select White or Black or allow a random colour to be selected.